This installation took place in a house in Pimlico, London. The Billington Partnership was recommended to the client who was under going a house refurbishment. It was our job to change the old-fashioned existing fireplace and replace it with something a little more contemporary in style. The Clandon Limestone Bolection surround by Chesney’s was the preferred design choice. 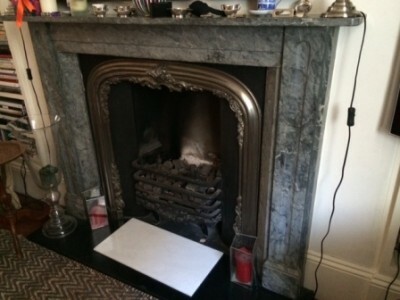 First of all, we carefully removed the existing marble fireplace and cast iron inset. 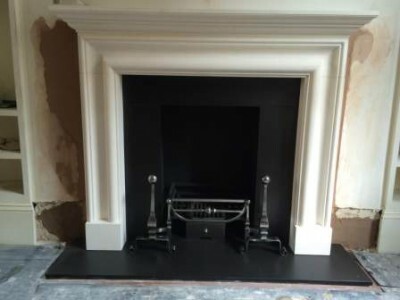 Then we fitted the Clandon Limestone Bolection fire surround. In addition we added a shelf to the fire surround. Finally, to complete the overall look, the client chose the Chesney’s Morris fire basket and Burton fire dogs. The client was extremely happy with the transformation.